Use this adapter to connect a compatible high-performance digital-to-analog (DAC), such as the AudiQuest DragonFly® Black or Red to a computer, tablet, or phone with a USB-C port. The DAC bypasses your device's internal audio circuitry, so you can enjoy richer, more accurate sound. This adapter features solid conductors with silver plating and foamed polyethylene insulation for accurate, low-noise signal transfer. I bought this to connect an audio quest dragonfly red headphone amp/dac to my Samsung Note 9 . It works great. usb A to USB c connections. USB Adapter for Android Devices: The DragonTail USB-C adapter activates USB Host Mode for newer Android devices, allowing the devices to transmit USB digtal audio to an outboard digital-to-analog converter (DAC). Using the DragonTail USB-C adapter to connect to an external USB DAC, such as an AudioQuest Dragon Fly (sold separately), will provide greatly improved audio performance. High Quality Construction: The DragonTail USB-C adapter for Android devices offers high-quality construction. 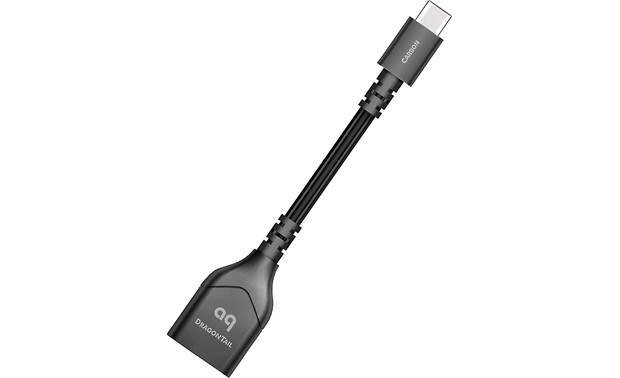 USB Connectors: On one end of the DragonTail USB-C adapter is a male USB-C connector which plugs into your Android device's USB-C port. On the other end of the adapter cable is a female USB-A connector which allows you plug in a full-size USB (type-A) male connector. Searches related to the AudioQuest DragonTail USB-C Adapter USB-C to USB-A female adapter.